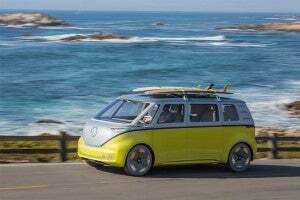 VW has been tinkering with battery technology since the 1970s when it built a prototype based on its classic Microbus that could manage to deliver just 25 miles between charges and run at speeds of up to 43 miles per hour. The MEB places its battery pack under the load floor and can use either one or two electric motors. The automaker’s first real commercial effort came with the 2014 launch of the e-Up microcar, which adopted a small lithium-ion battery pack capable of delivering range of between 75 and 103 miles, depending on terrain, weather and driving conditions. The German automaker is now set to make a big leap, hoping to take on Tesla with its first long-range model, the Audi e-tron set to reach showrooms later this year. The e-tron and Porsche’s new Taycan electric sports car, use proprietary platforms, and the two brands are now jointly developing an even more advanced architecture, dubbed PPE, that will be used for the VW Group’s most expensive and highest-performance battery-electric vehicles. The MEB, however, is targeting the mainstream. Like most new platforms, whatever their source of power, the MEB will have significant flexibility to handle products of different lengths, widths and heights. Unlike a gas-powered vehicle, however, the batteries and motors will be mounted under the floorboard, as is the case with the Tesla Model 3, Jaguar I-Pace and Chevrolet Bolt, among others. 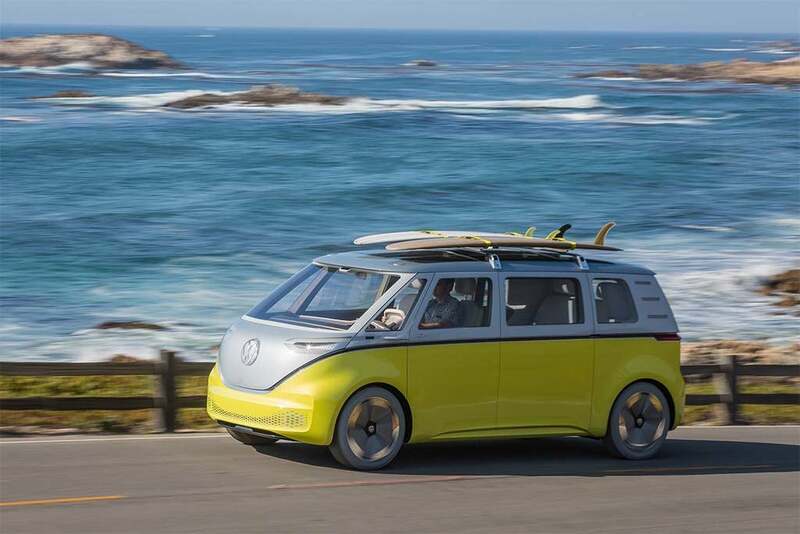 This approach – which some liken to a skateboard, and VW calls a “chocolate bar” — frees up space normally devoted to the engine compartment, Renna noted, allowing for a bigger cabin and more cargo space with a smaller exterior footprint. The MEB will also have significant flexibility in what’s mounted below the floor. Depending upon the target buyer, Renna explained, the battery pack could be large enough to deliver more than 300 miles range. For urban buyers who travel limited routes, that could be cut to 200 or less. VW will revive its classic Microbus around 2021 - but the new I.D. Buzz will be pure electric. Meanwhile, the MEB will have the capability of using either one or two electric motors. Base versions would use a single motor mounted on the rear axle, all-wheel-drive models adding a second motor up front. 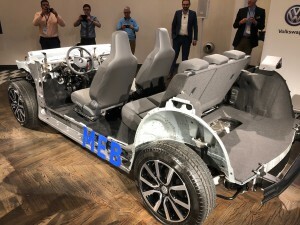 The size of the motors could also vary, with initial, rear-drive models using the MEB platform expected to deliver about 150 kilowatts of power, or 201 horsepower. Though Renna stressed “We haven’t finalized pricing,” the initial focus is on delivering relatively low-cost battery-electric vehicles, in line with the VW brand’s traditional mandate. As a result, there are currently no plans to incorporate sporty – albeit more costly – technologies such as torque vectoring in products based on the MEB. “This is meant to be a car for the millions, not millionaires,” Renna stressed, during a background briefing in Chicago. As for charging capabilities, the MEB platform is being designed to handle Level 3 chargers that can deliver up to 125 kilowatts of 440-volt DC current. That’s about 2.5 times more than the first generation of fast chargers – though not nearly as much as the 350 kW the PPE platform is being designed for. Most owners are expected to charge up at home overnight, or at the office, but should a car with a drained battery plugged in, an 80% top-off should take well under an hour. Ford is tentatively calling its first high-performance EV the Mach 1, though that could change, company officials told TheDetroitBureau.com. VW’s shift to electrification comes as a sharp reversal of course. The automaker was heavily focused on diesel power until a few years ago, when it acknowledged having rigged its engines to illegally pass emissions test. VW has since spent about $30 billion in fines and settlements. That includes $2 billion to fund Electrify America, a new subsidiary both promoting BEVs and setting up a network of charging stations across the U.S.
How fast battery power will take hold is still far from certain. U.S. sales grew sharply in 2018, but almost entirely due to demand for the Tesla Model 3. Nonetheless, VW has announced plans to spend over $50 billion on its electrification efforts. Whether it actually can turn a profit will depend on the sort of volumes it can generate – though it could also improve the business case, some analysts say, by partnering with a company like Ford which is also planning to launch new, long-range models, starting with a crossover due out in 2020. 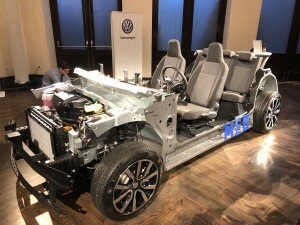 Ford and VW have confirmed they are discussing ways to work together on electrification, but the talks seem to have run into some snags, Jim Farley, the President of Ford Global Sales, cautioned during an interview on TV show Autoline: Detroit. The key problem is that while both automakers want to bring out long-range BEVs, they have laid out different targets, “almost like snowboarding and skiing,” Farley said. VW’s “battery size and motors are different from Ford, which is more performance-based” than the products the German company is developing. The first Ford long-range BEV will be a high-performance model drawing inspiration from the Mustang, albeit with a CUV-style body, Farley noted. The talks between the two companies will continue, but the sort of broad collaboration on BEVs seems less likely than it did just a few months ago. 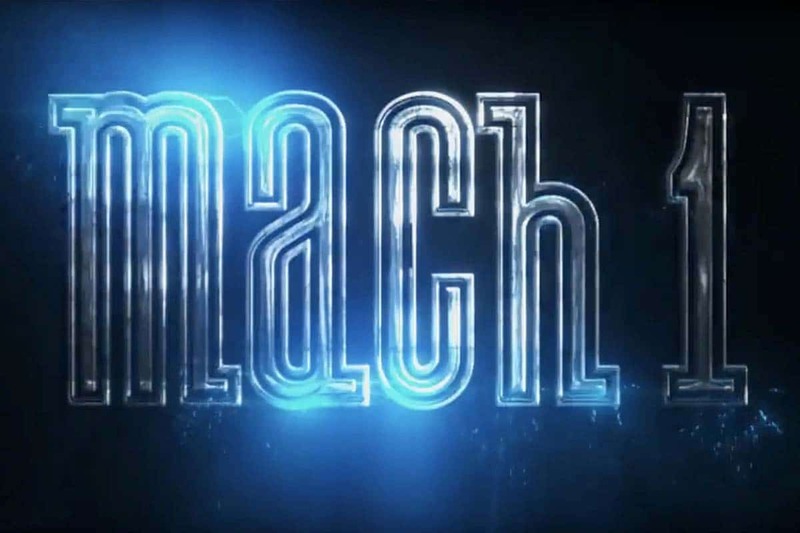 This entry was posted on Monday, February 11th, 2019 at and is filed under Audi, Auto Shows, Automakers, Automobiles, Business, Chicago, China, Concept Cars, Crossovers/CUVs, EVs, Electrified Vehicles, Environment, Europe, Ford, Fuel Economy, Investors, Markets, Porsche, SUVs, Sales, Sports Cars, Technology, Tesla, Trends, U.S./North America, Volkswagen. You can follow any responses to this entry through the RSS 2.0 feed. Both comments and pings are currently closed.